Britain's Chancellor of the Exchequer Philip Hammond speaks at the Conservative Party's conference in Manchester, Britain, Oct. 2, 2017. British finance minister Philip Hammond defended capitalism as the only route to prosperity on Monday, in an attempt to counter the opposition Labour Party's increasingly popular vision for a more centrally-controlled economy. 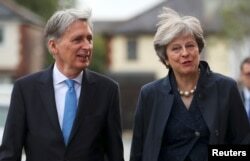 In a speech to the ruling Conservative Party that contained only two new policy announcements, Hammond also said that the government's immediate task was to deal with the uncertainty for citizens and businesses resulting from Brexit. Prime Minister Theresa May is grappling with deep divisions within her party over how to handle the Brexit talks and serious doubts about her leadership after her botched bet on a June snap election lost the Conservatives their majority in parliament and boosted Labour's hopes of eventually regaining power. Hammond, who was sidelined by May during the election campaign, said last week's Labour Party conference showed it wanted to impose on Britain, the world's fifth-largest economy, the "socialist fantasy" seen in Cuba, Venezuela or Zimbabwe. Britain's Prime Minister Theresa May and Chancellor of the Exchequer Philip Hammond visit a home near the Conservative Party's conference in Manchester, Oct. 2, 2017. "We saw Labour in the raw, exposed for what it has sadly become: a party taken hostage by a clique of hard-left extremist infiltrators, people who despise Britain's values and talk down our country," Hammond told Conservative Party activists. Seeking to put the economy center-stage in the Conservatives' pitch to voters, Hammond said Britain could only hope to experience rising living standards "by harnessing the power of the market economy." Last week, Labour leader Jeremy Corbyn set out plans for a much more active role for the state in the economy, including renationalization of key infrastructure, higher government spending, and more taxation and control of the banking sector. With opinion polls showing Labour gaining support, Hammond aims to convince voters that Corbyn would make them poorer. Labour's leaders, he said, "openly proclaim their ambition to demolish our successful modern market economy and replace it with a back-to-the-future socialist fantasy with hundreds of billions of extra debt for the next generation to pay." His words echo those of May, who last week issued her own defense of capitalism — a sign of growing concern about the threat Labour poses to the pro-business orthodoxy that has underpinned British economic policy since Margaret Thatcher's reforms in the 1980s. "Our economy is not broken: It is fundamentally strong," Hammond said, while also accepting that a lack of progress in talks on Britain's divorce settlement with the European Union and uncertainty over future ties were weighing on businesses. "The process of negotiating our exit from the EU has created uncertainty so investment has slowed as businesses wait for clarity," Hammond said. Business groups welcomed Hammond's defense of free markets, but said the government needed to do much more. "The speech shows a government strong on diagnosis, but weak on action. Businesses looking for clear vision and urgent delivery have been left with slim pickings," said Carolyn Fairbairn, head of the Confederation of British Industry. Hammond pledged 400 million pounds ($535 million) of additional road and rail spending and 10 billion pounds of funding to help young Britons get on the property ladder. The government has also announced plans to tackle high levels of student debt and limits on pay for public sector workers. "We must never deny or dismiss the underlying concerns that the election articulated: We must listen to them and we must respond," Hammond said, adding that the government should offer "pragmatic solutions" to improve ordinary people's lives. But with Brexit on the horizon, a slowing economy and the Bank of England hinting that interest rates could rise, May and Hammond have limited room for fiscal maneuver. The British Chambers of Commerce has warned that public rifts within the cabinet are undermining business confidence. Divisions over Europe helped sink the Conservative premierships of Thatcher, John Major and David Cameron. "Public disagreements between cabinet ministers in recent weeks have only served to undermine business confidence, not just on Brexit negotiations, but also on the many issues where firms need to see clear action from government closer to home," said the Chambers' director general, Adam Marshall. Last month, rating agency Moody's downgraded Britain's credit rating, saying government plans to reduce its debt load had been knocked off course and that Brexit would harm the economy. Labour said Hammond's speech on Monday was disappointing. "After 40 wasted minutes speaking and seven wasted years of Tory economic failure, the country expected to see the Chancellor change course," Labour's finance policy chief John McDonnell said. "But instead, after a year in the job, he is continuing down the path of his predecessor and clinging to an old economic model that fails the many."